The Teledyne ISCO accQlink™ accepts multiple inputs, including RS232, RS485, SDI-12, analog, and/or contact output. The robust design includes autonomous field operation using battery, solar, or permanent power sources. Data is accumulated from a variety of sensor types, transmitted securely, and stored either in cloud storage and/or a customer server. Data can be easily integrated into the facility SCADA system, modeling software, business intelligence platform, ISCO Flowlink Pro, or other software. ISCO cloud server allows for the viewing and management of data from anywhere with an Internet connection. ISCO cloud server also includes a graphical data management Web User Interface and can be programmed to send text or email alerts at preprogrammed thresholds. During data transmission from accQlink™, a built in Global SIM card chooses the strongest available cell signal and cell networks, ensuring maximum uptime. A yearly service plant includes all cell phone charges, data hosting, and web user interface. 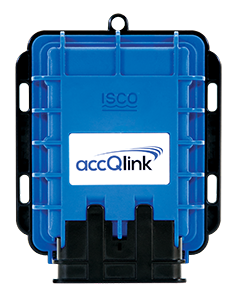 Finally, the accQlink™ offers digital communication options such as LPWAN (Low Power Wide Area Network), Bluetooth, and Satellite. For more information about the Teledyne ISCO accQlink™ contact Instrument Specialties by visiting https://isi.group or calling 407-324-7800.